One writer at FloridaSprintCarFans.com said it best, "Danny “The Hammer” Martin Jr. destroyed all comers last night at Volusia Speedway Park, lapping almost the entire field in a caution-free affair . . .."
Take a look at this recent video of The Hammer in Volusia near Nascar's famed Daytona International Speedway. The Hammer will be doing some testing and driving a stock car in June. The East Bay Sprints were able to run their first event of the season, losing their scheduled start on March 5 to weather. The lidlifter was not without drama as unofficial winner Danny Martin Jr. found his car protested by Greg Leonard. Post-race inspection found Martin’s winning ride to be within the rules and the victory stood. Martin grabbed the lead on the fourth lap. Jimmy Ballew led the first two, then drifted off the track with a broken oil pump. It gave the lead to Billy Boyd Jr. who kept it until Martin swept by. Boyd had to deal with a hard-charging Greg Leonard and lost second only to gain it back. Boyd crossed the finish in second with Leonard, Kurt Taylor and Johnny Gilbertson finishing out the top five. Ballew and Boyd took heat wins. 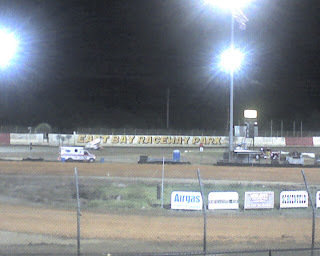 East Bay Raceway Website Reports: "East Bay Raceway Park hosted the season finale for the Top Gun Sprint Series and the results were similar to the track’s weekly show last week. 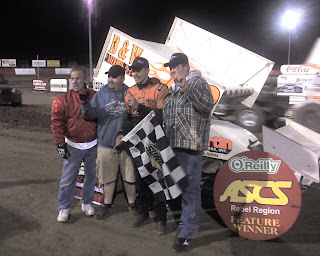 Danny Martin notched the 25-lap main to get his eighth series win of the year." "Martin inherited the point when early race leader Tyler Godwin spun on lap 4. Martin, who started fourth, was never headed in his quest for the win. The race started with a series of yellow flags before getting things rolling. Stephen Darvalics was chasing Martin until the car slowed on lap 13. Shawn Murray, racing with a nose wing damaged during the four-wide salute, picked up second and would never relinquish it." 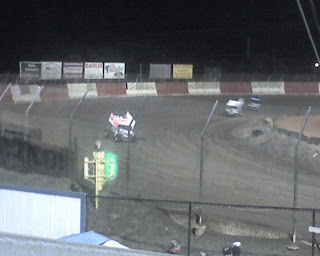 This is a shot of the 2005 Hammer Martin Shaw Sprint Car. He has been asked to return to Shaw to drive their 2010 factory ride. The effort begins in Florida tonight. 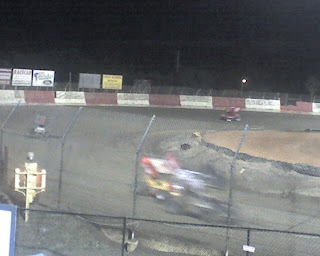 Gene Lasker is Live and Passing From East Bay Turn Four. Hammer on Back Stretch and in Turn Four. Countdown to Heat Races in Florida. 360 Racing in Tampa Bay tonight. Huge night at East Bay Raceway. Friday night, in a race Broadcast on Hot Wings Live, Hammer Martin returned to his house in Victory Lane at the Clay by the Bay, East Bay Raceway Park. In the first 360 Sprint Car Race of the 2009 season, American Sprint Car Series and Lonnie Wheatley noted that "just one week ago, Sarasota's Danny Martin, Jr., didn't have any concrete plans to compete in this weekend's 33rd Annual Winter Nationals at East Bay Raceway Park." "A last minute decision to piece things together paid off though. In fact, it paid off to the tune of a wire-to-wire win in the season-opening 25-lap feature event for the American Sprint Car Series Rebel Region atop East Bay's 1/3-mile clay oval. And, more importantly, it locked Martin into Saturday night's Eighth Annual Ronald Laney Memorial feature event, which is now slated to pay $12,500 to the winner. "We're wanting to race a lot this year, but the funds are running awfully low right now," the 22-year-old commented afterward. "A win tomorrow night would help out a bunch." Lady Luck was on Martin's side throughout the night, as he jumped into the redraw after gaining an extra position in his heat race following the disqualification of Brock Mayes, who lost a muffler. Martin then drew the pole position for the 25-lap feature event, gunned into the lead at the outset and led all the way to capture his fourth career ASCS Regional win aboard the Martin Structures No. 00, commenting that, "I'm just glad to be here, a week ago we didn't think we were gonna be able to run this one." Martin fought off several bids from four-time Lucas Oil ASCS National champion Gary Wright along the way, as Wright settled for runner-up honors in his debut aboard the Lubbock Wrecker Service No. 9x entry. Gene Lasker climbed from eighth to snare the show position, with Tony Bruce, Jr., taking the fourth and final lock-in position to Saturday's Ronald Laney Memorial. Travis Rilat raced from 14th to round out the top five, with Jason Sides, Lou Kennedy, Jr., Greg Leonard, Cale Conley and Terry Gray completing the top ten. Tyler Godwin, Sides, R.J. Johnson, Kennedy and Jesse Hockett topped heat race action for the 47-car field, with Matt Tiffany, Rilat, Gray and Godwin winning the "B" Mains. Tiffany was the first to exit the "A" Main when he encountered engine problems, while Hockett surrendered the third position prior to the midway point with mechanical woes." Thanks to Rich Vleck and Lonnie Wheatley of ASCS and Hot Wings Live. Saturday's feature will be broadcast on High Speed Radio. Danny Martin, Jr., netted his second American Sprint Car Series Rebel Region feature win of the year by wiring the field in Saturday night's 25-lap main event at Cochran Speedway. Starting from the front row outside, Martin outgunned polesitter Michael Miller at the drop of the green flag and led throughout aboard the Motorheads-powered Martin Structures No. 00 Shaw. Martin beat current series point leader Kenny Adams to the line, with Bryn Gohn, Matt Tiffany and Gavin Thomas rounding out the top five. Twenty-two year-old Danny “the Hammer” Martin, Jr. from Sarasota, Florida drove his Martin Structures/CnB Mushroom Farms/Motorheads powered #00 Shaw car to his first O'Reilly United Sprint Car Series feature win of the season at Penton Raceway on Friday night. Martin won the Engler Machine and Tool First Heat, then drew the pole in the K&N Filters Pole Draw before leading every lap of the 30-lap O’Reilly USCS Southern Thunder event around the high-banked red clay oval. Martin started in the pole position with 2005 O’Reilly USCS Asphalt Thunder Champion, Wayne Reutimann, Jr. from Zephyrhills, Florida outside him. The “Hammer” won the first drag race to turn one but had to re-do the whole thing when two cars tangled and the race had to be re-started. Martin repeated the feat on the re-start and led every lap while pulling away to a straight-away advantage during the middle of the race. At the finish line the next car was 6-8 car lengths back of Martin hoping for the caution that didn’t come. Lucas Oil Power Dash: Marshall Skinner, Terry Gray, Derek Hagar, Matt Linder, Clint Weiss, and Danny Martin. Engler Machine and Tool First Heat: Danny Martin, Jr., Marshall Skinner, Derek Hagar, Terry Gray, Jeremy Scott, Ray Bugg, Clint Weiss Roger Oakes. Butlerbuilt Second Heat: Wayne Reutimann, Jr., Shane Butler, Brian Thomas, Matt Linder, Jon Stinson, Bob Auld, Ricky Burnett. K & N FILTERS POLE AWARD: Danny Martin, Jr.
Martin built the engine and the victory in Saturday night's American Sprint Car Series Regional main event at East Bay Raceway Park - Martin wins again. In the Motorheads-powered Martin Structures No. 00, "The Hammer" led the only lap that counts, the one that mattered most, after a dramatic last lap pass of current series points leader Kenny Adams, Hammer wins. Adams appeared to be on his way to a second ASCS Rebel Region win of the year. ASCS Rebel Region Points (Top Ten): 1. Kenny Adams 436, 2. Danny Martin, Jr. 420, 3. Matt Tiffany 410, 4. Bryn Gohn 398, 5. Samantha Taylor 386, 6. Red Stauffer 380, 7. Frank Carlsson 370, 8. Matt Kurtz 329, 9. T.J. Winegardner 286, 10. Michael Miller 282. Recently a guy in Florida was blasting down the Expressway in his Ferrari Spider convertible. A Florida Highway Patrol trooper in a Camaro LT1 Interceptor nailed him at 130 MPH and issued a traffic citation. Now, this is a speeding ticket. This 2 minute video documents this wild ride. Video Courtesy of www.eStateTrafficSchool.com . The Hammer started 28th and finished 10th in the Florida 400 in Bradenton, Florida in a Mac Steele prepared unwinged sprinter. Dave Steele takes the win. A record field of 33 cars took the green. The Hammer is prepping a team for USCS Speed Weeks at his home track, East Bay Raceway Park in Florida. Plans are to run his own motors built by his own shop, Motorheads, LLC . Sprint Car phenom, Danny "The Hammer" Martin, Jr., won the 25 lap feature at Florida's East Bay Raceway Park on Saturday night. Running their own motor built by their own engine shop, Motorheads, LLC, Martin dominated the event. Florida sprint car vets Stephen Darvalics and R.J. Johnson rounded out the top three. Three-time O'Reilly USCS Hoosier Tire Young Guns Champion Danny Martin, Jr., from Sarasota, Florida started on the pole and wired the field leading flag to flag in the 30-lap O'Reilly United Sprint Car Series main event at Penton Raceway near Penton, Alabama on Friday night. The twenty-one year-old driver lapped cars up to seventh place in a dominating run. 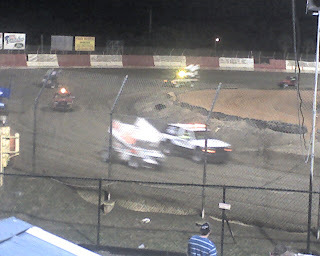 Here are a few dozen shots from the 410 season kickoff in Florida courtesy of www.eStateTrafficSchool.com. Click on Title to this post to walk through the pits and see a few extra shots. This 20 minute interview can be accessed by clicking on the link above to play the MP3 or by clicking iTunes link above to listen on iTunes or your iPod. 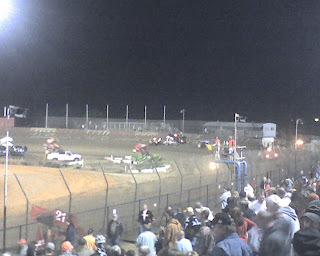 The American Sprint Car Series consists of 15 dirt track race series. ASCS Patriot Region Media Director Rich Vleck interviews Emmett Hahn in this podcast, recorded on Feb. 3, 2007 and broadcast live on www.HighSpeedRadio.com. Hahn lays out his vision of the future of open-wheel dirt track racing in the United States. From a top ten Time Trial in the first 410 Sprint Car race of the season at the Winter Nationals, to a Heat race win, to running all 40 laps of the feature on the lead lap with the big dogs of the World of Outlaws, Hammer is ready for the World of Outlaws season kick off near Daytona. 8th in Points going into Saturday's 360 Nationals, The Hammer wins a B Main and finishes the Feature 9th after a 19th Place Start on the inside of Row 10. A total of 73 cars competed in East Bay Raceway Park's 31st Annual Winter Nationals. Saturday night's "King of the 360's" Nationals got underway in a highly dangerous drizzling rain that threatened to cancel the event. Stay tuned for more as Hammer prepares for the televised World of Outlaws battle near Daytona during Speed Weeks. Here are a couple of Online Pit Tours for the fans.